There’s still a little time left for heirloom tomatoes, especially if you live in a warm climate! 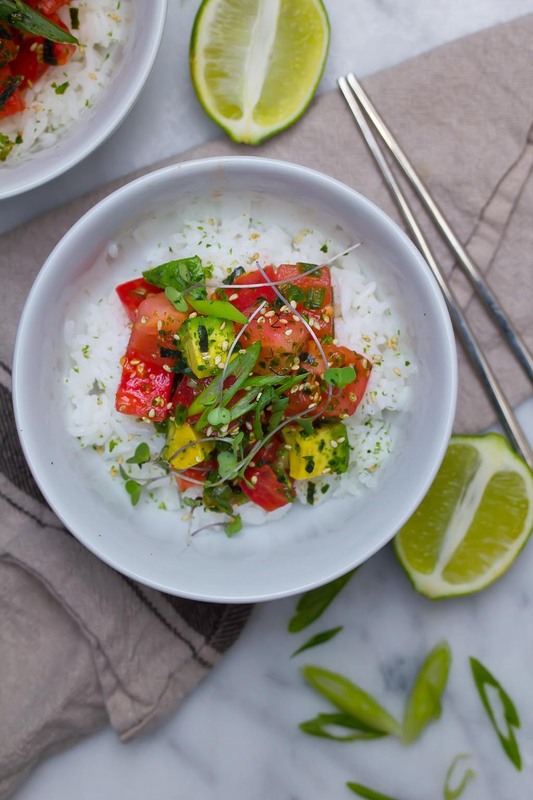 It may even be pretty hot still, and this chilled tomato vegan poke recipe can be very refreshing. Poke is very trendy right now! 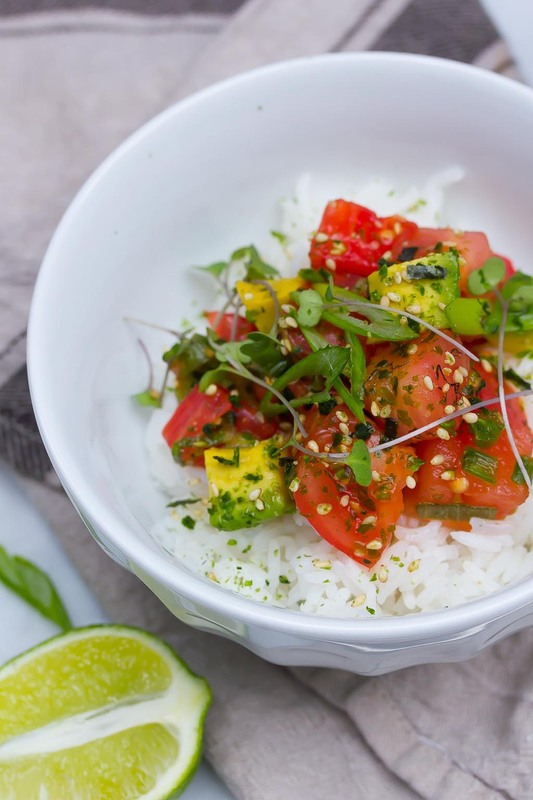 It’s a raw fish appetizer served in Hawaiian cuisine, usually salmon or octopus, but there are endless variations being served up by chefs these days! A vegan version can be made with cubed tomato that looks very similar to salmon. Flavors of soy, sesame, ginger and jalapeño bring this dish to life. Rinse the rice well, at least 5-7 times. Soak in water for 1 hour in a heavy saucepan. Cover and heat to boiling. Reduce the heat to low and simmer for 20 minutes. Do not open the lid while it’s cooking. Allow to rest for 10 minutes covered after it’s done cooking. Fluff with a fork before serving. Whisk together the tamari, sesame oil, scallion, ginger and jalapeno. Toss with the tomato, scallion and matchstick cut radishes. 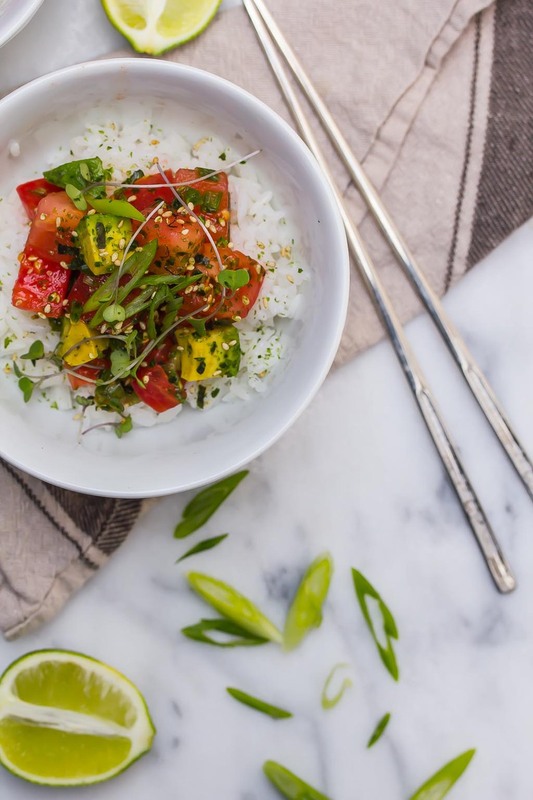 Arrange the poke onto the sticky rice and garnish with daikon sprouts and sesame seeds.